Pop filters are one of those things you don't consider when you first get into microphones. However, as you keep learning new things and getting familiar with the entire concept of recording vocals, you will realize just how important a pop filter can be. Today we are going to show you our picks for top 10 best pop filters on the market and talk about why we think you should check them out. Or, if you want to learn how to choose one for yourself, check out or in-depth buying guide found at the end of the page. Without further ado, let's get right to it. On the expensive end, but worth every penny. Stedman is a name you will see a lot if you do even the slightest amount of research on this topic. They are known for delivering solid solutions that range from affordable, to more high end ones. The one we are looking at here is one of their better models. Proscreen XL covers a 6 inch area, making it a great choice for full size condensers. If you look closely, you will see that the mesh used isn't your standard nylon piece. Instead, Stedman Corporation went with a sturdier metal mesh that lets more air through, all while still getting the job done. In terms of build quality, Proscreen XL is rock solid. The frame that holds the mesh is strong, thick and doesn't give in very easily. That whole assembly is bolted to a flexible boom arm which enables you to position the screen any way you want to. Even though we haven't spent to much time playing with this model, it is fair to say that it can take quite a bit of bending without giving you any trouble. At the end of the boom arm is a standard clamp which allows you to install the pop screen on any microphone mount out there. Overall, Stedman Proscreen XL isn't cheap, but it is worth the additional investment. Same quality as the XL with a smaller form factor. Perfect if you don't need a large pop filter. Moving on we have another Stedman design to show you. This time around it is a lightweight model that features a slightly smaller area coverage than the one we just talked about. You are looking at a 4.6 inch diameter instead of a 6 inch one. However, you will find that 4.6 inches is more than enough even for larger condensers out there. The main difference between these two models is the lack of a frame. Instead, Stedman PS101 comes with a low profile design that reduces the frame to a small portion at the bottom of the mesh. Speaking of mesh, it is the same max airflow metal one. Generally speaking, we found PS101 to be every bit as good as the Proscreen XL. The only real question is whether or not you really need that extra real estate. If the answer is no, you PS101 is definitely something you should consider. The boom arm is pretty much the same, which can also be said about the clamp. In terms of performance, PS101 does a great job at eliminating pops without causing that HF cut. At the end of the day, that is all that really matters. Fits great on the Blue Yeti or any other microphone and for a great price. Blue has pushed through the ranks in these past few years, running into very little resistance. Aside from making great mics, they also make a whole bunch of accessories. 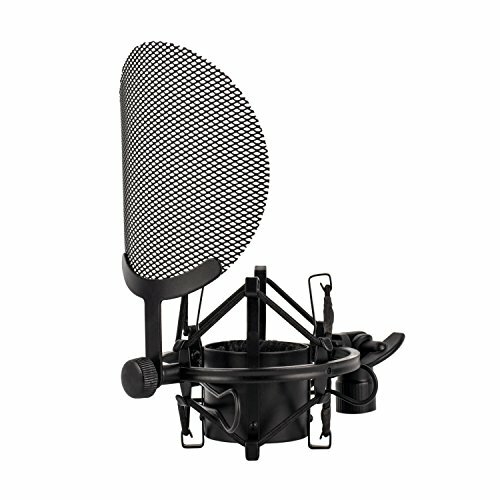 If you are trying to find a good Blue Yeti pop filter, then this model might just be what you are looking for. Blue went with a slightly different design compared to what most other brands use. It is a semi cylindrical shape built out of a rugged metal materials. You will notice its extended frame, which does add some weight but ultimately allows for a very rigid construction. The mesh is anything but standard. There are actually two layers to it. First one is a fine nylon mesh that filters out most aggressive pops, while the second one is a much wider metallic layer. Mounting is done using a standard clamp fixed to a flexible arm. It is worth noting that the arm is a bit short by most standards, making it a tight fit for most standard condensers. Additionally, Blue Universal Pop Filter is just that, universal. You can use it with any microphone out there. The only real thing that might be an issue for some people are the aesthetics. Blue went with a chrome finish which may not fit into everyone's idea of a good looking pop filter. With that said, it all comes down to personal preference. The Semi-Cylinder design helps reduce static and lived up to our expectations. Semi cylindrical designs are not as rare as one might think. Here's another one, this time coming from Avantone. They pretty much adapted the standard pop filter design in a way that extends its effective radius. Truth be told, it's not a full semi cylinder, but it delivers a very similar performance. From a build quality point of view, Avantone did a great job at creating a functional, reliable but also flexible design. Grille design isn't really your regular nylon mesh, but the pattern isn't as wide as some metal meshes either. It hits a happy medium. Mounting this microphone pop filter is easy thanks to a standardized clamp at the end of the flexible neck. One advantage of using this type of design over the classic nylon mesh is the fact that you can wash it with soap. Avantone has coated the entire thing with a protective layer, making it fairly resistant to rust and degradation in general. 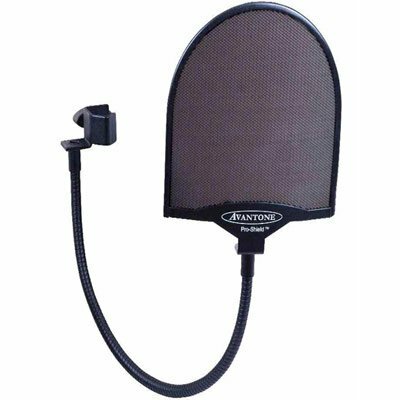 If you need a proven pop filter with plenty of coverage, Avantone PS-1 PRO-SHIELD is the way to go. If you are just starting out or don't need the top of the line, the PS01 can get the job done. Samson's designs aren't necessarily complicated nor too advanced. However, one thing this brand knows how to make is a product that works. Their PS01 is the epitome of functional simplicity. Samson actually ships this particular model with a variety of their mics. With that said, you can definitely use PS01 as an accessory to just about any mic with a stand. Build quality is great all things considered. Samson went with a standard nylon mesh stretched in a sturdy, thick frame. Flexible neck is a well made piece with plenty of range. Interestingly enough, Samson used a sturdy clamp. A much sturdier one than we usually get to see. All things considered, Samson PS01 is definitely worth the money, especially if you are trying to find something that takes care of a wide spectrum of plosives. If you need a shock mount and pop filter in one package, the SSPF-4 is a great choice. Here's something slightly different. Nady's SSPF-4 isn't really a pop filter. Instead, it represents a complete shock mount with a built in pop filter. If you are wondering why would anyone choose something like this, the answer is very simple. With an integrated pop filter, you don't have to worry about range of motion or whether or not there is enough length in that flexible arm for you to properly mount the filter on your mic stand. The only real downside is that this product works best with condensers. Speaking of which, chances are you will want to get a shock mount of some kind anyway. Nady's SSPF-4 may not be the absolute best option on the market, but it definitely works well enough to get you by if you are on a budget. Build quality is great and the whole thing inspires confidence. Once you put the mic into the shock mount, you will find that it sits just right in relation to the pop filter. On top of that, Nady used a solid metal mesh which is inherently better than a standard nylon mesh filter. In other words, it is a gift that keeps on giving. Works great with the Blue Yeti at a cheaper price. If you are not satisfied with what Blue has to offer in terms of pop filters, there are always aftermarket filters like this one from Auphonix. It is a pop filter for Blue Yeti that perfectly fits the stand these microphones come with. With that said, it can be used with a number of different mics, but we strongly suggest that you go with this option only if you own a Yeti. Now that we got that out of the way, lets check out what this thing is made of. First thing you will notice a rather thick frame which adds plenty of rigidity and support. This isn't just for show. Auphonix has used a double mesh design that incorporates a wider layer covered with a finer nylon mesh on top. Does it work? You can bet it does. When mounted on a Blue Yeti stand, the filter itself sits perfectly in front of the mic. It is a very easy and effective way to get rid of the plosives without making your Yeti look untidy. 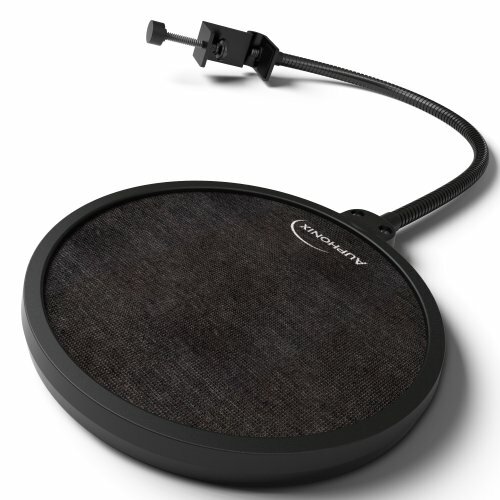 Nady is responsible for another awesome mic pop filter on our list. This time around we have a pretty robust design that is meant to be as practical as possible despite what kind of mic you are running. Best of all, it is borderline dirt cheap. On paper, MPF-6 brings a rather classic design. We have a fine mesh mounted on a thick frame. All of this extends to a reliable and durable gooseneck, which leads to a pretty sizable clamp that is also sturdy. You can mount the MPF-6 on a desktop, mic stand or a boom arm. If you are new to microphones and just want something that works, you really can't go wrong with Nady MPF-6. It is a rock solid design with a stellar track record. Last but not least, we want to show you a rather unusual but pretty effective pop filter. WETECH U Shape features a self-explanatory shape. It is a semi cylindrical unit that has no gooseneck mount. Instead, you mount the entire cage directly onto a microphone. To do this, just place the mic between the elastic bands and the internal mounting frame. But wait, is it even a good idea to have the pop filter touching your mic's grille? It actually doesn't have much of an impact. Instead, you have the benefit of using a more compact package that still works incredibly well. Speaking of performance, WETECH U Shape is on par with most gooseneck designs out there. It even works better than a good portion of them. At this price, it is a steal. It goes without saying that this particular mic filter works best with condensers. It really needs a large grille if you want to mount it properly. 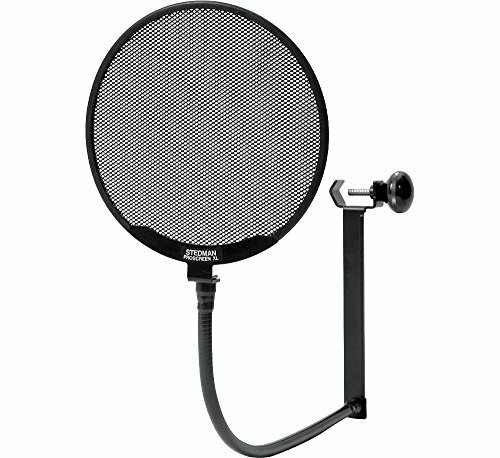 Pop filters are a must-have accessory for anyone who wants to record clear vocals. This goes for both singing or speaking. 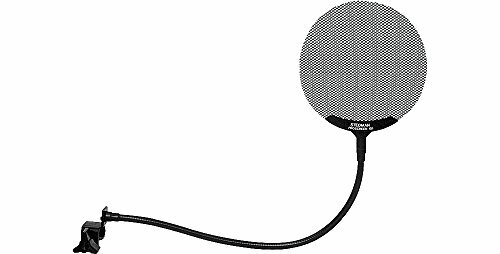 In most basic terms, a pop filter is a synthetic or metallic mesh that is placed in front of a microphone. Most come in form of a circular frame that is attached to your mic stand using a flexible gooseneck adapter. With that said, some utilize different mounting methods. In order to answer this question, we have to dig deep into mechanics of human voice, microphone design and how these two work together. Human voice, much like any other audible sound in nature, is nothing more than a set of vibrations that travel through air. We call these vibrations sound waves. When you talk, you are essentially moving air in a way that creates sound. Even though this might be a very rudimentary explanation, we won't go any deeper for the sake of this guide. In order to record voice, we figured out that we need a device that can recognize those sound waves and translate them into medium that can be stored. What we came up with are microphones. Despite their large appearance and complicated layout, there is really one core component in every microphone - diaphragm. A diaphragm is a thin membrane that is sensitive to sound waves. When a sound wave hits a diaphragm it translates that information into mechanical vibration. This is then converted to an electric signal that is stored using various means. Where Do Pop Filters Fit into All This? Well, it turns out that human voice can sometimes be too much for an average diaphragm. To be more specific, there are certain sounds which cause a burst of high pressure sound waves that completely overwhelm the microphone. These are what we call Plosives. A great example of plosives are words that start with letters P or B. That initial P is enough to overload the diaphragm and cause it to record an anomalous tone. As you can probably imagine, plosives are definitely not something you want to deal with when recording a song, podcast of whatever. Before we go into how pop filters deal with this phenomenon, it is worth mentioning that some vocalists are capable of minimizing or even completely eliminating plosives from their performance. However, that is a variable that adds too much uncertainty to an already complicated process of music production. That is why just about every recording studio out there has their mics fitted with a pop filter. The principle behind pop filters is extremely simple. Plosives that run into a pop filter before they hit the microphone break up to a point where they lose all of that unwanted energy. The whole magic happens as the air hits the mesh and is ultimately neutralized. Thanks to pop filters, you don't have to worry about pronouncing words that start with P, B or other critical letters. Even though we have just said that pop filters are extremely simple by design, there is still some depth to this piece of gear. As it turns out, there are some cons to using a fine mesh in a pop filter. While it does a great job at dealing with plosives, producers and sound engineers have noticed that fine mesh tends to shave off a certain amount of higher frequencies. Granted, this is something an average user wont even notice, but the loss of frequencies is definitely there. Okay, if fine mesh isn't perfect, what is the alternative? The best alternative we have today is a metallic mesh. Compared to a super fine but tightly knit nylon, metallic mesh allows for much more air to pass through. If you go back to our top list, you will find plenty of example of metallic mesh. Using this design has proven to minimize the loss in higher portion of the frequency range, without having a negative impact on plosives reduction. One of the first and most obvious ones is durability. Nylon mesh is extremely prone to damage. All it really takes is for you to catch it with your ring or even a nail and it's done for. With a decent metallic mesh, you won't have that problem. Next reason why this design is better is hygiene. If you walk into a studio that doesn't use windscreens on their microphones, you will probably see that most of those mics have a rusted out grille. That is because of the saliva that's ejected when you sing or talk. In all honesty, it is just a normal part of talking. If you think this isn't possible, just ask a studio tech. Damage won't be done in an hour or even a day. But give it a couple of months and your windscreen or microphone grille will become pretty messy. Same happens to pop filters. Cleaning a nylon pop filter is a delicate process that requires quite a bit of caution if you don't want to destroy the mesh. With metallic ones, all you really need is some soapy water and a brush. There's nothing better than a squeaky clean pop filter. 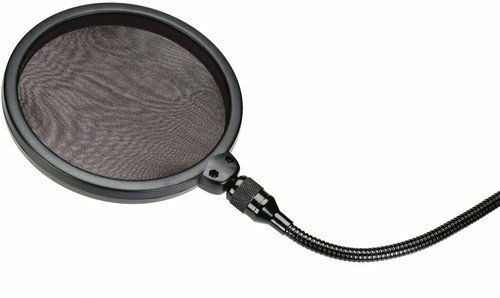 One of the less common designs comes in form of dual layer pop filters. As you can probably guess, these feature two layers of mesh where one is usually made of fine nylon while the other is a more robust metallic one. You would think that these bring the best of both worlds, but that isn't always the case. Depending on how tightly knit the nylon layer is, you might have that dulling of the voice we have discussed earlier. On the other hand, these do a really good job at eliminating even the most aggressive plosives you are capable of producing. There is one misconception that you will run into when researching this subject. It is usually spread by people who lack both experience and knowledge on the subject and it has to do with windscreens and pop filters. If someone tells you that these two are the same, do yourself a favor and seek advice somewhere else. There is a big difference between a pop filter and a windscreen. A wind screen is essentially a piece of foam that goes over the microphone grille. Contrary to popular belief, it serves as a protective shield that soaks up saliva and eliminates the effects of a slight breeze. In terms of plosives, you might as well not use a windscreen. If you truly want to eliminate plosives, a pop filter is by far the only option you have. DIY Pop Filter Or Store Bought One? Since pop filters are so simple, you will see many people opting to build one themselves. All kinds of stockings are mutilated for this purpose and some of these DIY builds probably even work. However, it all comes down to what kind of performance you want. Using a homemade filter is a good idea if an aftermarket one costs more than your mic. People who have a Best Buy microphone that isn't even meant for actual recording will find DIY filters to work just fine. However, if you have already invested into a proper condenser microphone or even a good dynamic model, why compromise? Pop filters used to be expensive which is what prompted the whole DIY movement. Fortunately for us, market dynamics have forced most of the brands to cut those prices to a more realistic level. 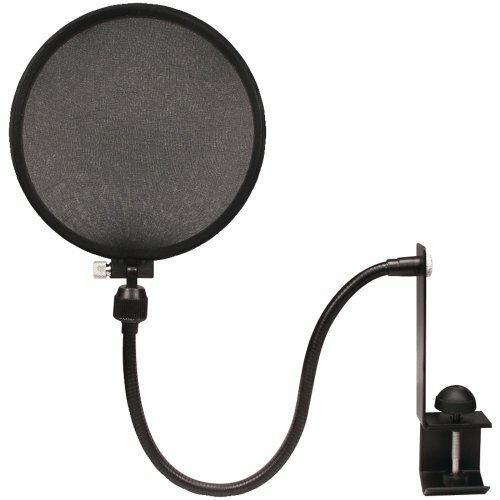 You can literally get a pop filter at dirt cheap prices. Another issue that plagues most DIY builds is the mounting method used. You can have the best pop filter in the world, but it won't do you much good if you can't mount it securely in front of your microphone. All in all, getting an aftermarket one is just easier. How to Find A Best Pop Filter For Your Needs? When shopping for a pop filter there are several things you should consider before making a decision. As simple as these devices are, a tiny bit of planning and research can save you from a lot of disappointment. To keep things simple, we will boil down the whole process to several factors. First thing you need to figure out is the size of the pop filter you need. Next comes the type of pop filter you need, and finally we have the mount. Let's look at each individual factor up close. When it comes to pop filters, size matters. Figuring out how much real estate you need will depend on the microphone you are using. Smaller mics don't really require a large diameter filter, but larger ones definitely do. Further more, you might want to decide on the shape of the filter as well. As we have seen from our top picks up there, some filters are flat while others are semi cylindrical. The difference in shape mainly impacts the ease of use. With flat filters, you really need to make sure that you are talking into the center of the mesh. Otherwise you might find some of those plosives in your recording later on. Curved designs are much more forgiving in this regard as they cover up the mic from more than one side. This is where the whole nylon mesh VS. metallic mesh discussion comes into play. There are awesome models that feature both of these solutions. I guess that the main metric here is the price of the filter. Metallic mesh ones tend to be a bit more expensive, but if you ask me they are worth it. At the end of the day, it all comes down to what you can get as well as what you like. The type of mount the filter comes with is important. For some reason, this particular factor is often times the most overlooked one as well. The vast majority of aftermarket filters use a flexible gooseneck mount that screws into the pop filter frame on one end, while the other is where the clamp is. This particular design has proven to be the most effective and easiest to use. There are generally two things you need to look for here. One is the length of the gooseneck while the other is the width of the clamp. Length of the gooseneck is pretty self explanatory. If it is too short, you won't be able to place the filter in front of the mic. As for the width of the clamp, that metric will dictate what kind of surfaces you can mount the filter on. If you just want to mount it on your mic boom arm, you will find that most models will allow for that. However, if you want to mount it to a desktop, you might want to check if the clamp has enough travel to accommodate for that. With all that in mind, some filters use less common mounting systems. For example, that WETECH utilizes two rubber bands to get the job done. When dealing with atypical mounts like this one, it is a good idea to check if they fit your particular mic, stand or boom arm. Using a pop filter isn't really complicated at all. However, there are few simple steps that you should definitely follow in order to get the best performance you can out of your rig. The first advice we have is to place the filter at least 4 inches away from the microphone. That is about as close as you want to have it. If you put it any closer, you are running a risk of capturing residuals from plosives that are breaking up in the mesh. The other advice is to tilt the filter slightly in relation to the microphone. This way you are preventing any sound reflections from reaching the microphone. Tilting the filter is especially important if you have a smaller diameter model. Smaller frames are closer to the mic capsule and tend to be more prone to sound bouncing back and forth. At the end of the day, getting a pop filter is the best investment you can make excluding the microphone itself and a proper shock mount. As we have seen today, these things are pretty affordable which means that there is really no excuse to not own one. Any one of the models from our list will do a great job and allow you to record your vocals with ease. We hope that you have found our guide to be helpful in terms of understanding what pop filters do and answering some questions you might have had.